Victoria Budson, executive director of the Women and Public Policy Program at the Harvard Kennedy School, to give keynote address. 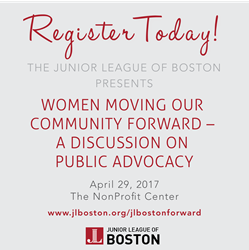 The Junior League of Boston (JL Boston), an all-women, volunteer-led organization serving the Greater Boston, area will host “Women Moving Our Community Forward - A Discussion on Public Advocacy” on April 29, 2017 at the NonProfit Center in Boston. The conference is a unique training and dialogue experience designed to foster conversations between JL Boston members, advocates and women from our neighborhoods on how women can work together to build and improve our communities through public advocacy. The conference will feature three panel discussions and a keynote address from Victoria Budson, executive director of the Women and Public Policy Program at the Harvard Kennedy School. Ms. Budson has been an advisor to the White House Council on Women and Girls. She is also the chairperson of the Massachusetts Commission on the Status of Women and has served as a board member or advisor to numerous other organizations. During the three-panel discussions, participants will learn how to take action in the community, how local and state governments work and will also hear the personal stories of women who have affected change in our neighborhoods. Conference registration is now open. For more information or to register, please visit: http://www.jlboston.org/jlbostonforward.